In Wild Apricot, you can allow for memberships to be automatically activated once the applicant submits the membership application form, or you can make them conditional upon receipt of payment and/or approval by an administrator. If you make membership conditional upon approval or receipt of payment, the membership application will be reviewed – by the system for payment and by an administrator for approval – before it is activated. You can enable membership application review separately for each membership level, so that only certain levels require administrator approval or payment in advance. If you've set up membership bundles and enabled administrator approval, only the bundle administrator will need approval. Bundles members will be managed by the bundle administrator. Until a membership is activated, new members are not able to register for events using member-only registration types. 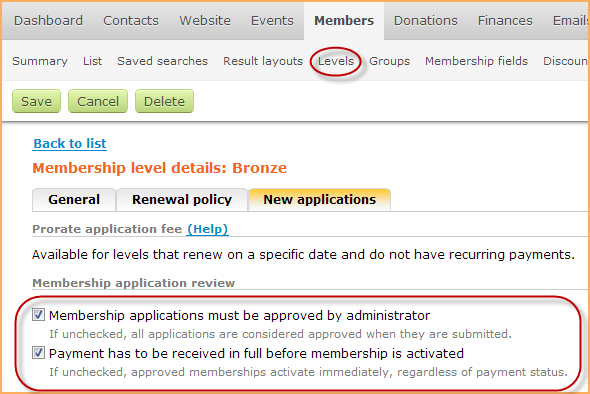 Click the membership level you want to set up application review for. Click the New applications tab. If you want membership applications for this level to reviewed and approved by an administrator, check the Membership applications must be approved by an administrator option. If you want membership applications for this level to be conditional upon payment being reviewed, check the Payment has to be received in full before membership is activated option. When you are finished choosing your application review options, and other new application options, click the Save button. If you enable both application review options, the system will check first whether the payment has been reviewed before displaying alerts regarding the need for administrator approval. If you want visitors to be able to join as a member and immediately take advantage of member-only registration types, you must leave both these options unchecked. Payments are automatically recorded for online payments, and can be entered manually for other forms of payment (e.g. cash, check). For more information, see Payment settings. When an online payment is completed, it is automatically settled with the corresponding invoice. For manual payments, the administrator must settle the payment to the invoice manually. 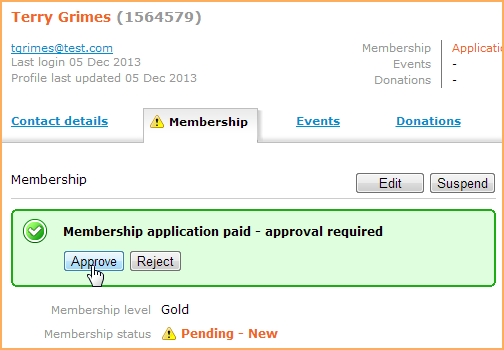 If administrator approval is required, the membership status of the applicant is marked as Pending - New . 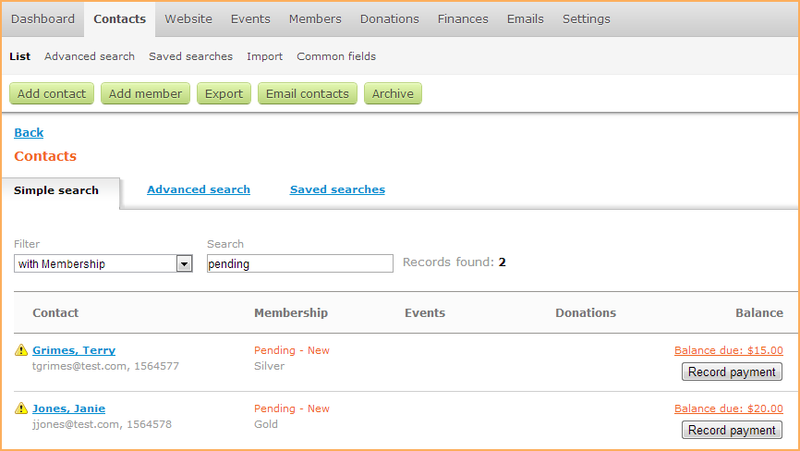 You can search for members with this status by performing a keyword search for the pending from either your contact list or member list. To approve a new member, open their contact record and go to the Membership tab. From there, you can click the Approve or Reject button. Records of rejected members remain in the system as contacts. For instructions on deleting contacts, see Deleting and archiving member and contact records. After approval, the membership status is set to active. Depending on your membership level settings, a membership activation email may be sent to the new member and to administrator. Go to the contact's Membership tab. 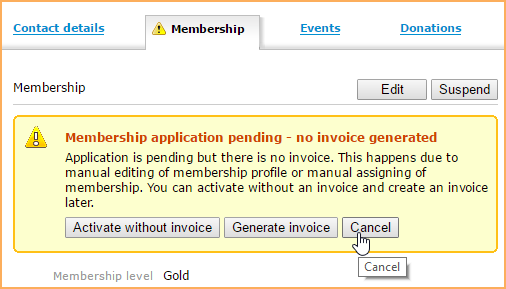 Click the invoice number within the pending notice to display the invoice details. From the invoice details, click the Delete invoice button. You will be asked to confirm the deletion. After you confirm the deletion, you are returned to the contact's Membership tab where an option now appears to cancel the application. From here, click the Cancel button. The membership application is now deleted, and the applicant is now a non-member contact without any membership history.